If you’ve ever met up with the AltRider team at a rally or a ride weekend, you probably know we’re big fans of Nitro Circus. There’s nothing better at the end of the day than to kick back with a cold beverage and watch some hooligan crazier than you attempt ridiculous stunts – and somehow make them happen. I’ve always joked that the real reason I started AltRider was to meet Travis Pastrana. The fact is he walks the talk, very few live up to expectations. He sets a great example. So imagine how I felt earlier this week when I unexpectedly ran into him while in Vegas. He was hanging out, signing autographs for fans who recognized him, and trying to keep comfortable with his leg in a cast (though at this point he’s a pro with broken bones). I walked over to introduce myself, and we got to talking for awhile. Turns out, his partner rides one of the big KTMs in his free time and is always looking for a chance to sneak away for an adventure ride. He mentioned a lot of the guys from the rally circuit like the big ADV bikes. So of course I gave him a catalog, since we’re building parts for the orange bikes right now. Travis is a great guy, and it was good talking to him a bit about riding and competing. There’s a reason people like him – not just a skilled athlete, but someone who is genuinely happy to meet his fans. 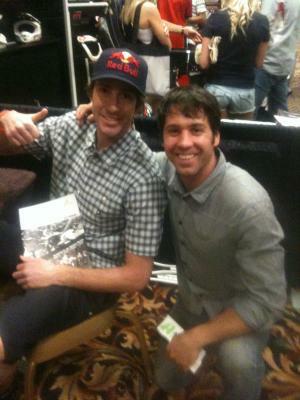 Meeting Travis Pastrana: one more thing I can mark off the bucket list. But riding with him? Still waiting to be checked off.